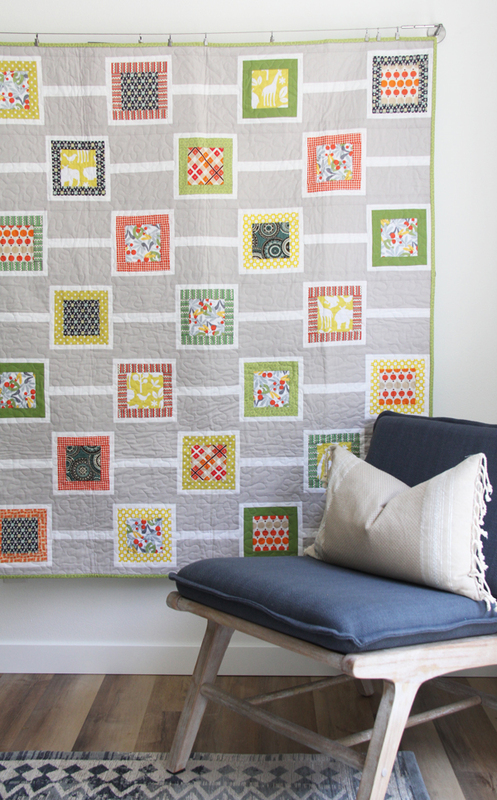 I’m back today sharing a new/old quilt pattern…Chain Reaction. I first made this quilt in 2010, with slightly smaller blocks and only in a crib size, so it was well over due for an update with new sizing. 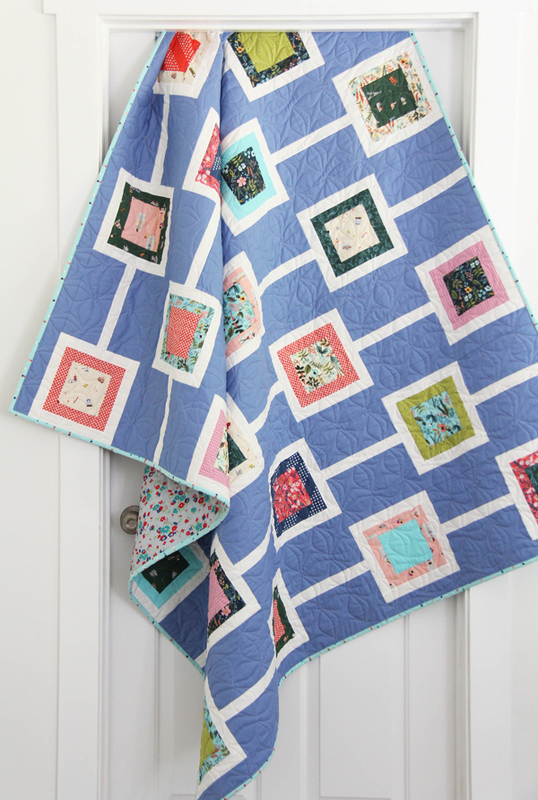 This one can use fat quarters, or 10″ pre-cut squares (which I prefer for a more scrappy, random look). I cut out 25 squares from my Amalfi yardage and a few basics to make this version. The background blue is Kona Cotton in Denim. Kaitlyn quilted this one again…it’s so perfect for this pattern! Since I never took a proper photo of it years ago….here is the second/gray version of the Chain Reaction quilt too. There are just a few minor changes to the updated version to make it more multi-size friendly. This quilt is 8 years old and it still looks brand new! 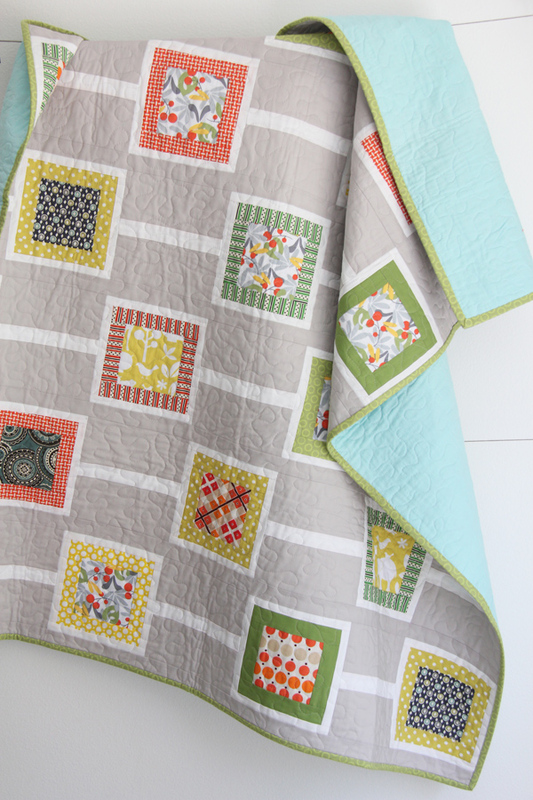 It’s had a long life being carefully stored…but now it’s time to give this quilt a home with some proper use! I quilted this one with good ol’ stippling (the wavy design). This is back when I stippled EVERYTHING. I know some people hate stippling…but just looking at this quilt makes me want to break out all my quilt tops and start stippling for days. I kinda love it. If you’ve never tried it here is a link to a how to video…it’s addicting once you get the hang of it! The PDF for Chain Reaction can be found here. The paper version can be found here. Gorgeous! I love the blue. It’s mostly neutral with just enough color to be fun. Thanks Sara! You can’t go wrong with a pretty blue! Love them all. What a great pattern. Love the baby picture too. Fun to see an older picture of a quilt like that. What a fun way to showcase some favorite fabrics! I checked out the stippling video and may give it a try. Usually I so more of a custom look but I can see where stippling would be a great choice — especially for a baby quilt. Thanks for the link! Another beautiful quilt! 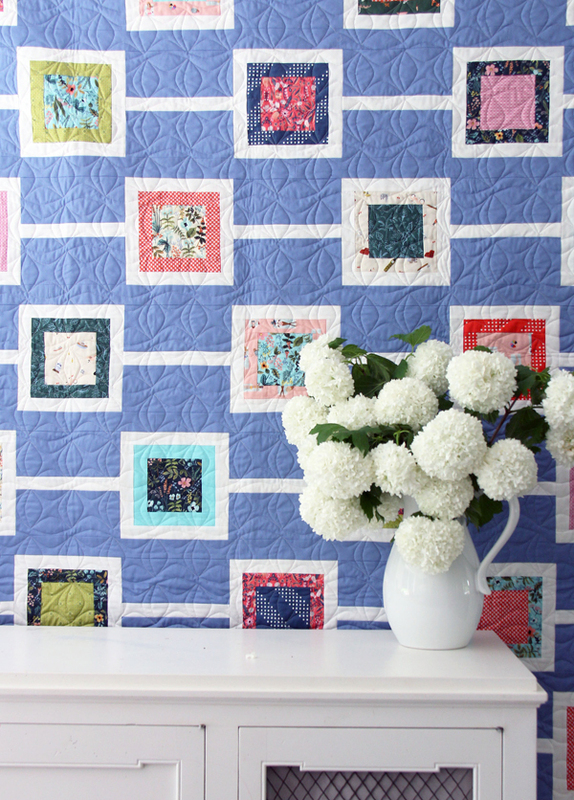 I too love the blue fabric.Another quilt to add to my bucket list.BTW: I’m am using an old tutorial of yours for a quilt I am working on: the hourglass pattern from 2012. 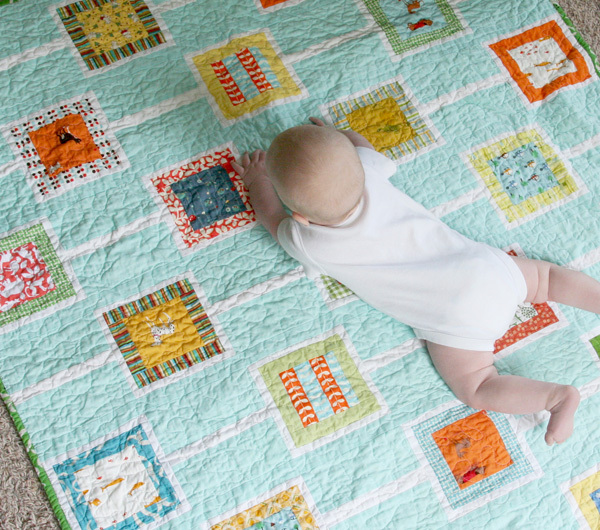 Old tutorial + new fabric colors = a fun baby quilt. Thank you for your clear instructions and inspiration, Allison! Hourglass quilts are my favorite! Your updated “Chain Reaction” is great! And the older one…what’s not to love? Stippling is my absolute favorite! I still love this pattern. I’ve made several iterations but my favorites will always be a pair of lap size photos quilts I made for my friend’s kiddos for while their dad was stationed overseas. 6 years later and theystill love them and have taken them with them all over the world. Oh I love this! Also Shannon… email me and I’ll send you an updated pattern! I love meandering/stippling. I think it’s often the perfect stitching for most quilts because they have mostly straight lines/piecing. Give the eye something to rest on. 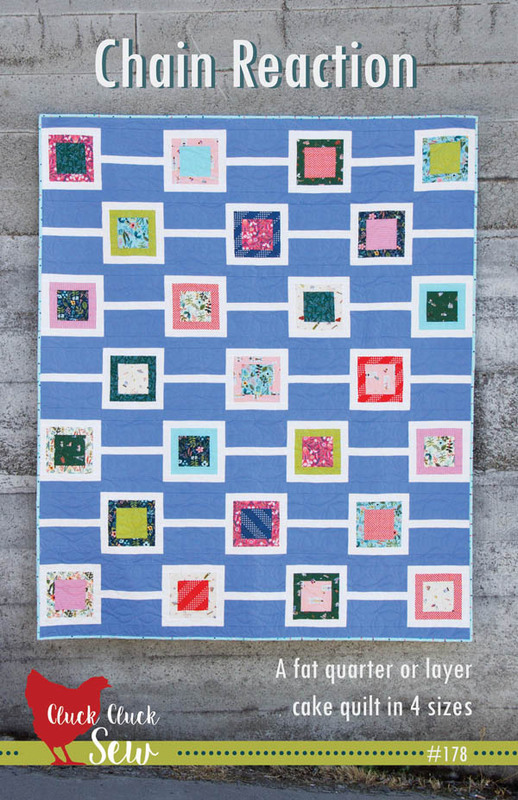 I love this quilt and will order the pattern when I get home from work! It’s just what I’ve been looking for to showcase some special fabric I’ve been hoarding. I love the blue background one, and I’m not a ‘blue’ person! I ordered it the other day when I saw that blue! Ha ha thanks and I’m glad you like the blue! I am definitely a blue person…I could make every background blue and be a happy camper! 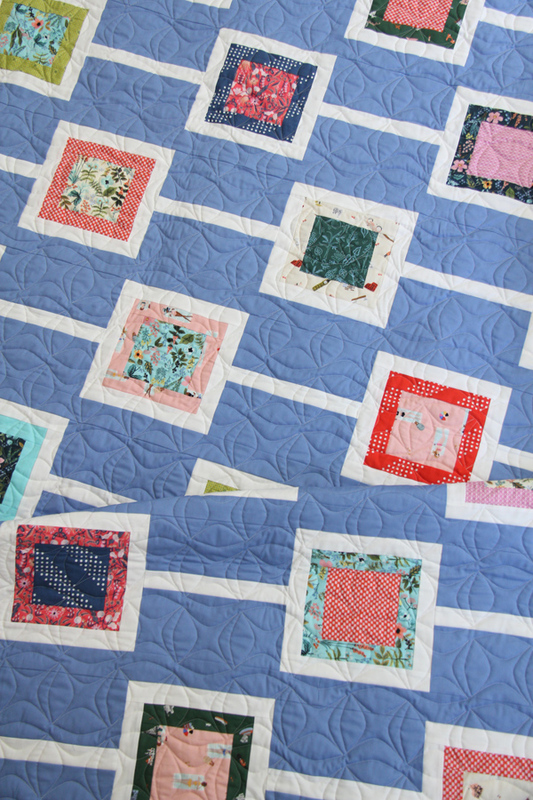 What steps do you take to “carefully store” your quilts?